Keeping up the New Year’s Resolution to get DDC back up into seventh gear and keep it there, even with the pressures of the Real World intruding……….on a picture search this morning I came across this forgotten moment from 2002. Yes it is the Castle Combe British GT round, lap one approaching Quarry, the second placed Geoff Lister slightly overcooked his braking and ended up spinning to the back of the pack. I imagine the moan of photographers standing with me all took evasive action as the sequence ends at this point……..I certainly would have ducked. Geoff got the Saleen back on track but probably wished he had not. Storming through the field a few laps later he was unsighted in traffic and, at high speed, ran straight into the stationary Porsche of Tony Littlejohn, who had just been knocked into a spin. Both cars were severely damaged and Geoff was hospitalised, though thankfully without serious injury, he never raced in GTs at International level again. 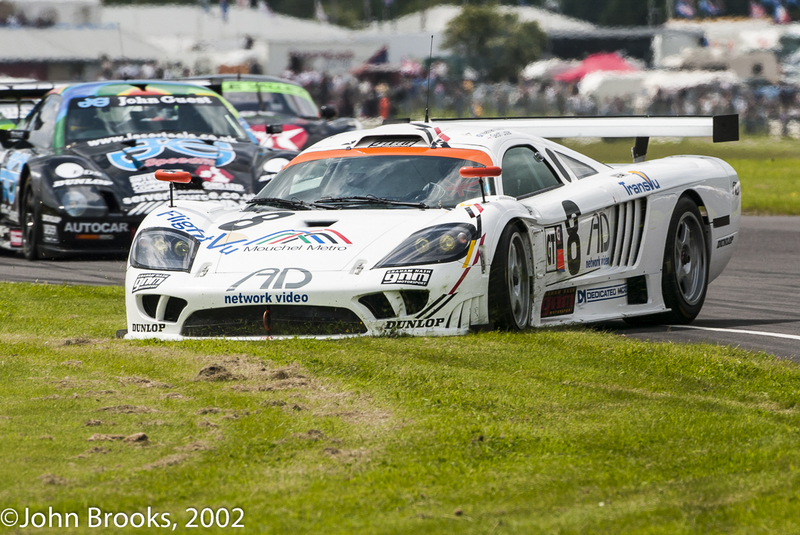 This entry was posted in Nostalgia, Notes from the Cellar, The Blink of An Eye and tagged British GT, Castle Combe, Geoff Lister, Graham Nash Motorsport, Saleen S7R on January 5, 2014 by John Brooks. He did return many years later but that was the last GT drive and if the Porsche had been a right handed the outcome may have been much worse. Thanks KK, I have just seen a replay, it was awful………..